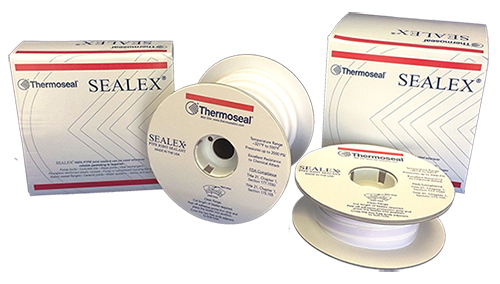 Thermoseal Archives - Gallagher Fluid Seals, Inc.
Sealex® joint sealant does not support bacterial growth or cause product contamination and is FDA compliant. It has virtually no shelf-life concerns since PTFE is unaffected by normal environmental conditions. It has excellent resistance properties to chemical attack. It is ideal for most chemical services at temperatures to 500°F (260°C) and pressure to 2,000 psi (138 bar). It is also suitable for cryogenic use to -321°F (-196°C). Some applications in plants call out for isolation kits to maintain the integrity and reliability of a pipeline and piping system. Isolation kits are designed to work in conjunction with flanges, gaskets, and/or bolt sleeves and washers by eliminating metal-to-metal contact and halting static electric currents. At times they are relied upon for critical applications in severe temperatures and conditions. Industry’s first choice are phenolic gaskets. They are often supplied in kits, but they are hard and typically take a lot of load to seal. And lack of load is the number one reason for gasket failure.